In my mailbox is a weekly meme hosted by The Story Siren..
Aine for sending this to me, along with some awesome swag. The Unwritten Rule by Elizabeth Scott. Special thanks to Elizabeth for sending this to me. Elizabeth's awesome, and I highly recommend checking out her blog. She's always doing some fun things on there. 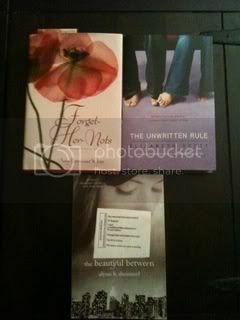 The Beautiful Between by Alyssa Sheinmel (arc) . This is part of an arc tour hosted by Around The World Tours. And here are a few others I didn't get a chance to take a picture of. Candor by Pam Bachorz. Special thanks to Amy Brecount White. I won this in her around the blog flower tour. She rocks! Check out her site. Something Like Fate by Susane Colasanti (arc). This is part of the Traveling Arc Tours. 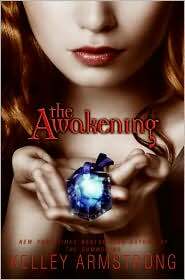 The Awakening by Kelley Armstrong. This is book 2 in the Darkest Powers trilogy. Rogue by Rachel Vincent. This is book 2 in the Shifters series. And that's it. So, what's in your mailbox? Nice swag there! I am so jealous! I want to read almost all of them! You got something like fate! FUN! And tons of other fabulous books! Yay! Wow great books! I'm really looking forward to the release date of Something Like Fate! Hope you enjoy them all! Wow, those are some fantastic books! I'd love to read FHN and TBB! Thanks for sharing my contest on your blog! It's much appreciated.